Have you ever read the ingredient list of some granola products out there? I’ve seen some pretty good packaged options, but many are full of not only additives, but excess sugar and oil, too. I’m okay with a little oil and sugar, but dad’s recently thrown a kink in his new vegan diet – he’s avoiding oil, as well. When I was home for the holidays, I decided to whip up a new granola recipe just for him, so that presented a new challenge. The granola dad had been eating was pretty decent, but I think homemade is always better. 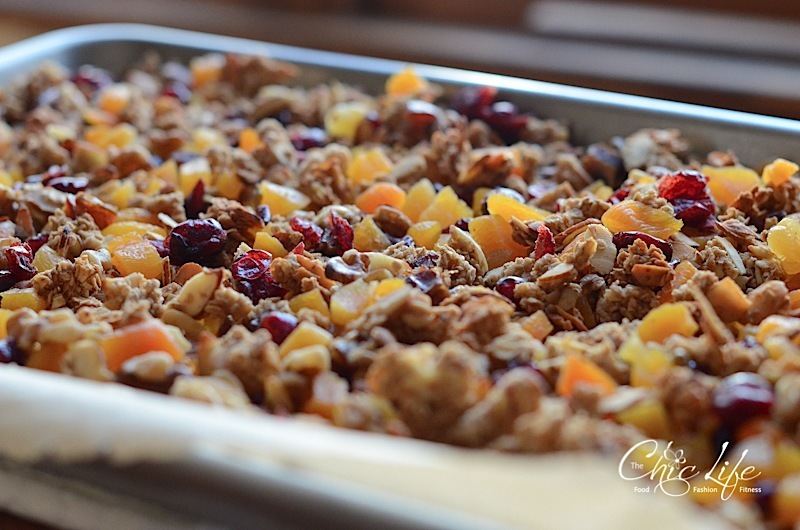 Since I had plenty of free time, I experimented and came up with this Oil-Free Fruit and Nut Granola Recipe. Thanks to the mix of dried fruits, this bowl of granola was vibrant and colorful. Here’s the granola sans fruit. Dad’s a fan of variety, so I put a couple different kinds of nuts and seeds in this mix based on what my parents had at their house. You could easily swap out your favorites…same with the dried fruits. Sometimes you just want a simple granola recipe that doesn’t use a ton of ingredients. 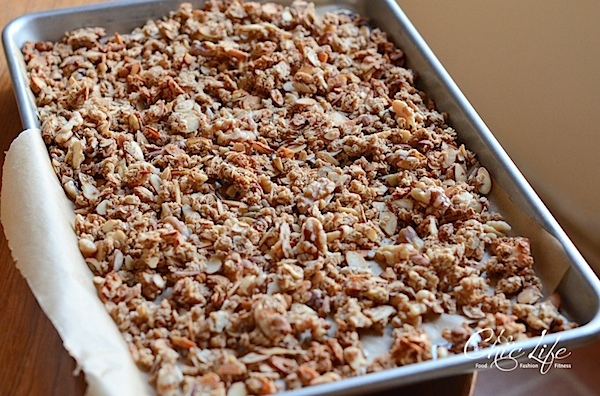 Here’s an easy recipe that tastes delicious and has less sugar than most granolas and no oil! Pre-heat oven to 300 degrees F and line a large baking sheet with parchment paper (or use aluminum foil and brushed lightly with oil). In a large bowl, combine dry ingredients oats, almonds, and salt and stir to mix well. In a medium bowl, combine wet ingredients apple sauce, maple syrup, and additional sweetener (if using), and stir with a whisk to mix well. Bake, stirring every 15 minutes for 45-60 minutes, or until granola is browned to preference. Remove from oven and stir in dried fruit. Serves 6-8 depending on how large your serving sizes are. Feel free to sub out your favorite fruits and nuts to customize this recipe to your taste. 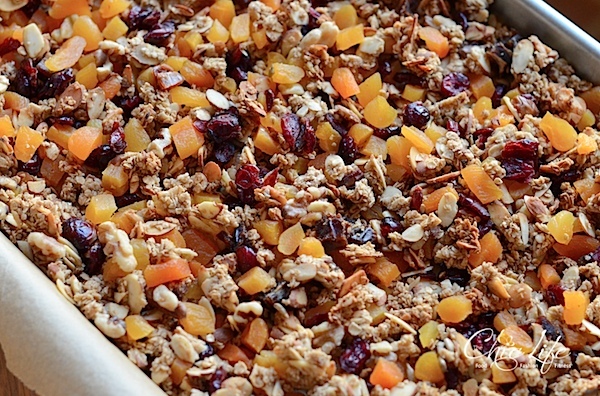 A big batch of granola would be great to whip up on a Sunday afternoon for the week ahead. I actually did a ton of food prep today for Eat in Month whilst listening to the Tori Amos station on Pandora. I was happily cooking and baking away, singing to some beautiful music, and enjoying the moment. It was simple, but lovely. 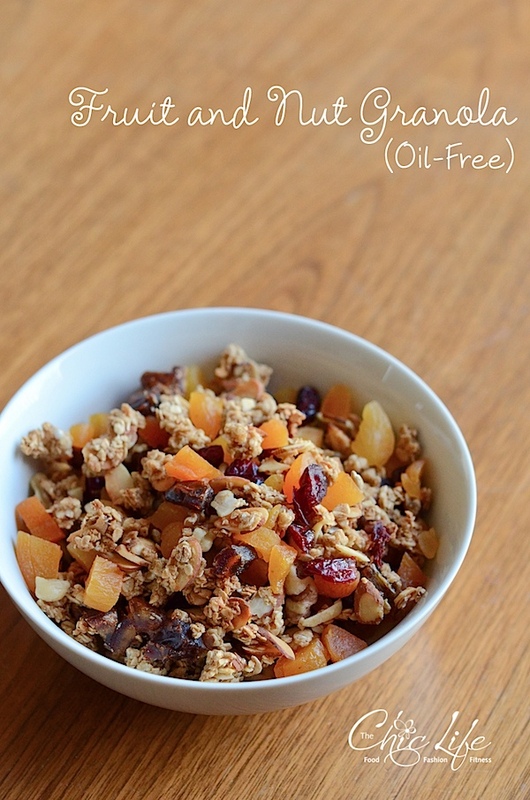 Hope you enjoy this Oil-Free Fruit and Nut Granola Recipe. Have a great week, everyone! This recipe looks so yummy! I love granola, but I have a really hard time finding good quality granola that isn’t full of unhealthy oils and sugar, so this is a great alternative. Hi Jennifer! I hear ya! I hope you like this recipe. Let me know how it turns out for you. I just made a new one today, too with cinnamon, maple syrup, and dates. Yum! 🙂 I’ll be sharing that recipe soon! 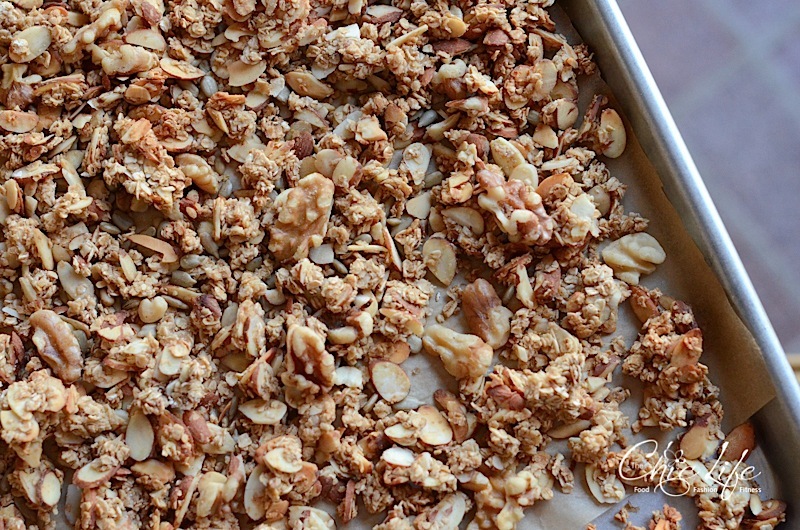 I just made this granola and it’s fantastic! It has just the right amount of crunch and sweetness. I accidentally cooked the chopped dates with the oats and almonds (whoops! ), but it still turned out ok. I love this! I’ve made granola with apple sauce and reduced oil, but I’ve never tried all apple sauce. On my list of things to try! I love a good homemade granola. It makes the whole house smell so good when it’s cooking and like you said, it’s nice to avoid the unnecessary additives. This one looks delicious!! Just made this today. Delicious! I followed your recipe, but added a mix of raisins and dried cranberries to it. Wonderful and so easy – thank you!